PRAM DINGHY 8 - #PB 1S - On Sale! PACKETTE 10 - #PB 17S - On Sale! WENSUM 11 - #B 32 - On Sale! LAKER 12 - #609 - On Sale! FOAMCREST 12 - #B 75 - On Sale! SPRINTER 14 - #740 - On Sale! SEA BEE 15 - #677 - On Sale! HARTLEY 24 - #C 22 - On Sale! HARTLEY 28 - #C 26 - On Sale! Car top roomy sailing dinghy of unusual design. A single chine 1/4 in. plywood pram hull, with a solid inner keel to give rigidity, but with chines wired and covered with fiberglass tape. Ample reserve buoyancy under foredeck and stern seat. Dagger-board trunk is supported by a rowing thwart. A small outboard motor may be used. Rigged as a spritsail sloop with a removable bowsprit. Halyards lead to a pin rail, which also supports the mast. Bottom is stiffened and there are no loose bottom boards. 9 ft. long, 4 ft. 4 in. beam, draft 6 in., or 27 in. with dagger board down, weight about 90 lbs. Sail area 52 sq. ft. All spars are shorter than the boat. First assembly uses a temporary former which is cut up later for buoyancy compartments. 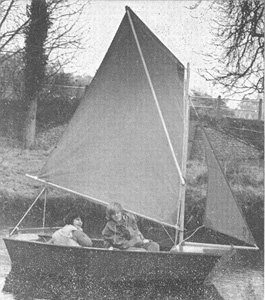 A sporty boat for young people though it can be sailed by two adults, and will carry four under oars or power. An easily-handled general purpose boat for caravanners or others unable to tow a trailer. Plywood requirements - 3.5 sheets 1/4" (6mm) x 4' x 8'. POWER 1 - 3 H.P. WHAT IS A STITCH & GLUE KIT?